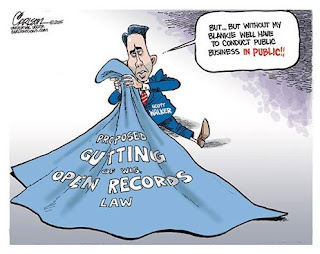 In the dark of the night, just before the long Independence Day weekend, Wisconsin Republicans tried to slip in a budget amendment that included the gutting of open records laws. The Republicans did eliminate the provision but said that they were going to create a legislative committee to study the issue, meaning that they were going to wait until no one was looking and then pass it anyway. If the gentle reader thought that was the end of it, the gentle reader forgot that with all things Walker, there's more. There's always more. Gov. Scott Walker pointed the finger at Republican lawmakers Friday on a widely criticized proposal to curtail Wisconsin’s open records laws, calling it “a huge mistake” that didn’t originate in his office. “I think it was a mistake to even think about it in the budget, even though it didn’t come from us,” Walker told radio host Charlie Sykes on Friday. Say wut?! If it was such a mistake, why didn't Walker say so at the time instead of helping them draft the changes? But it doesn't end there. Because - you guessed it! - there's more. There's always more. On Friday, proving that they are the slowest learners in the world, the Republican legislators said that they are going to deform the Government Accountability Board (GAB), the watchdog group that ensures that politicians are following the rules and that elections are fair. In other words, if the criminals can't hide their crimes, they are going to do away with the police, the prosecutors and the entire judicial system. One would think that after the severe firestorm they went through in trying to remove government transparency, they would have learned their lesson. But like I said, they are the slowest learners in the world. 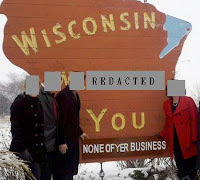 What makes the whole thing surreal is the rationale that the Republicans are using to attack the GAB - an anonymously written editorial in the Wall Street Journal that cites unnamed sources accusing the GAB of asking the IRS to investigate the dark money groups that Walker had been illegally collaborating with. There is no evidence that the IRS took any action, if these emails were even really sent. Even worse, they are accusing the GAB of being on a political witch hunt, even though the GAB is made up entirely of retired Republican judges. One would have to be a completely blithering idiot to believe any of this. Unfortunately, as we see time and time again, Wisconsin and the rest of the nation are filled with these clueless fools. But the real question is this: If Walker and his Republican cohorts are willing to go to such extremes to wipe out government transparency and accountability, exactly what are they trying to hide?